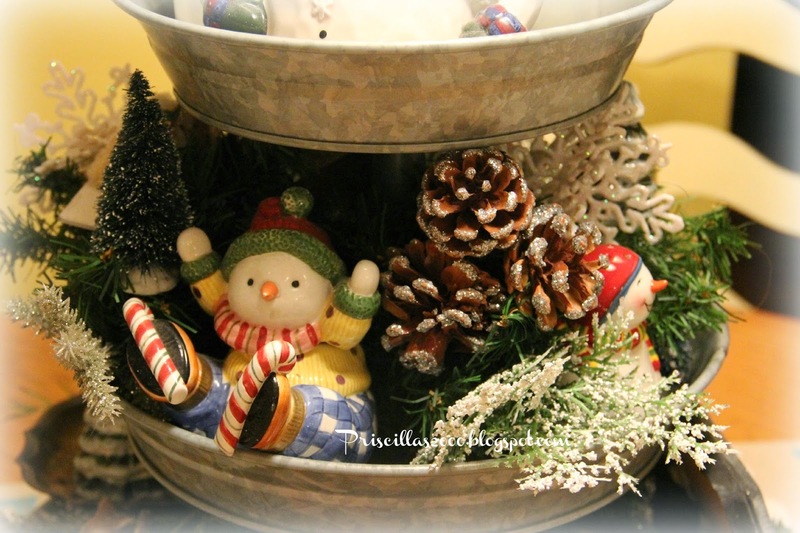 I am still loving decorating this galvanized tray that I got at Sam's club this spring for the seasons! This little snowman is a Fitz and Floyd piece..I used alot of glittery pinecones..greenery and snowflakes.Bottle brush trees and glitter branches.. This snowman is from the Goodwill ..its a pair of salt and pepper shakers. The deer and trees are from BHG at Walmart ..more salt and pepper shakers. There are little Putz type house ornaments that came from Joann Fabrics. 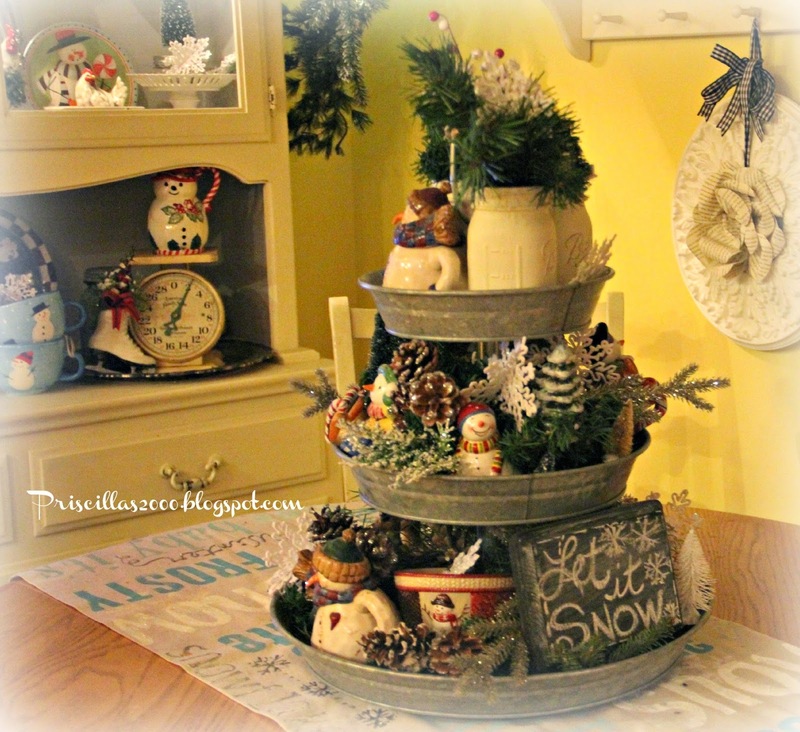 The painted mason jars on top hold greens , snowflakes and some red berries.. It's a cold one here today ! School is closed because of the temperatures ! Christmas is almost all put away ..here is one last shot of the big tree..
All the Prairie Schooler ornaments are back in their drawer to wait for next year .. Hope there are more of them ! 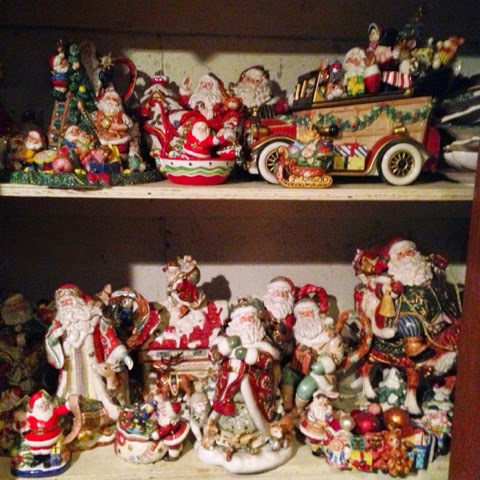 Everyone always asks where everything gets stored.. here are all the Fitz and Floyd Santas in their closet in the basement .. 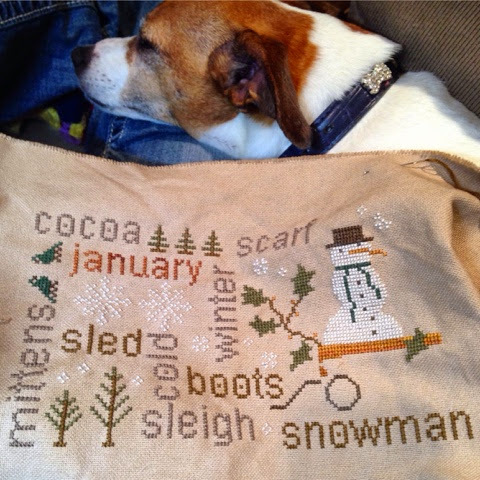 Still working on Januarys stitching projects ...hope to finish them this week ! I really LOVE that tray!! And how you decorate it. I can't believe I missed it at Sam's Club but will be looking out for it this spring in case they bring it back!! I do love this. Especially the way you have decorated it. I have a smaller version I got from Cocalico Creek Country store at Leesport Flea Market. (in PA) NO Sam's Club club near to me. I also have collected up a few vintage tin pans and some spools to try and make my own this winter. I LOVE your decorations. That BIG tree is beautiful...... I always hate to see my decorations come down after Christmas. This year we only put up a small 4ft tree since our elderly dog went blind I did not want to block his walkway..... But I still made sure to put my special handmade ornaments on that little tree. Hope you are staying warm in the cold, I know I am. It is going down to 15 tonight in South Carolina.. YIKES! Oh mercy, it is cold where you are!! I don't think I would leave the coziness of home. I love your tray on the table with all the pretties. I need a basement!!!! We have to box and place in the garage rafters. The picture of Ronnie, or is it Reagan? It cracks me up!!! 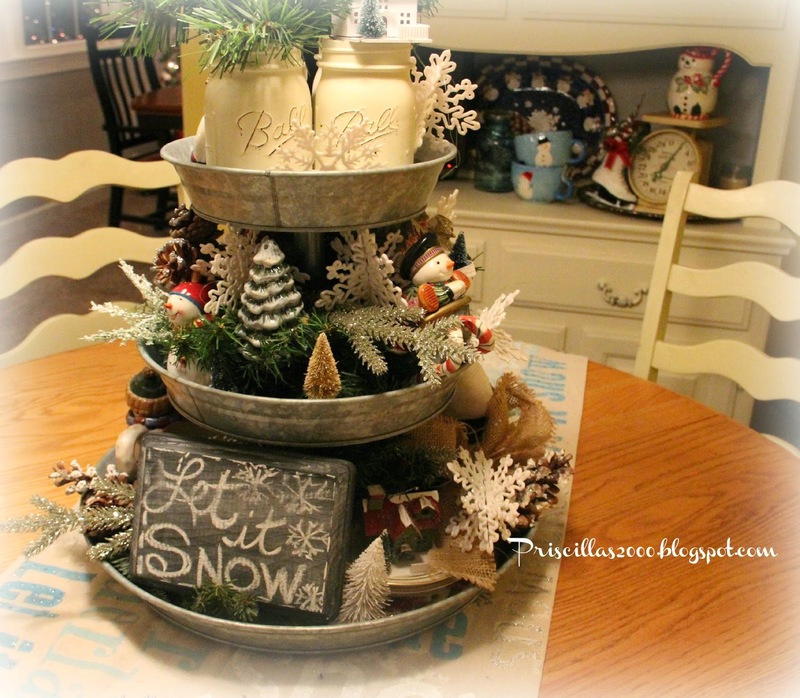 Love your galvanized centerpiece! Christmas must be so fun at your house. The decorations are all so merry and bright! Hope your 2015 is off to a great start! Love it! 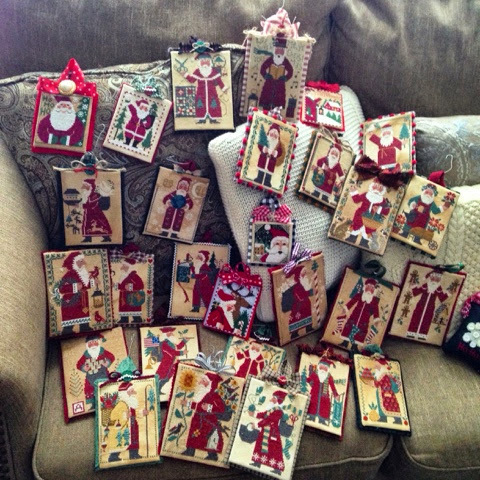 When I shared your Christmas one over on my blog FB page they all went crazy over it. It went viral! Hope they came over to visit with you. Thank you for coming to the party. I would never have thought of using the salt and pepper shakers the way that you do. It's a great idea! Tray looks beautiful. Love your tray and your centerpiece! So industrial/farmhouse looking! 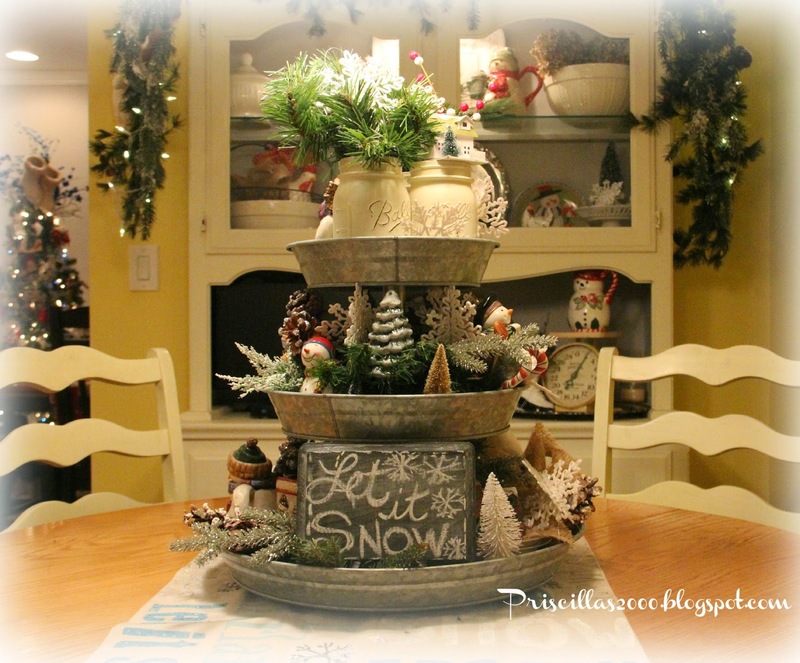 Such a great looking centerpiece, Priscilla--I love spotting each little accent piece that you've put into the tray... 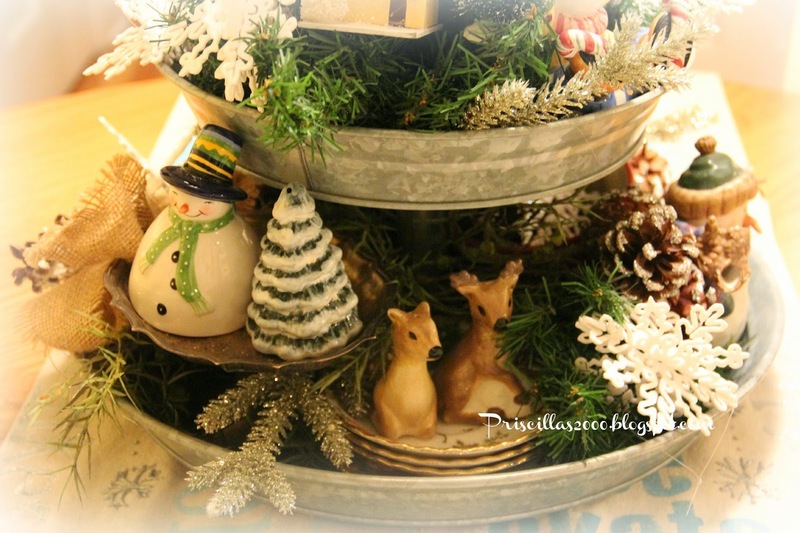 The reindeer are adorable, too--great idea for using salt and pepper shakers. And I loved seeing the line-up of all your PS Santas. How wonderful! I really need to work on some of the annual ones this year, too. Hello, I'm visiting via Home Sweet Home. 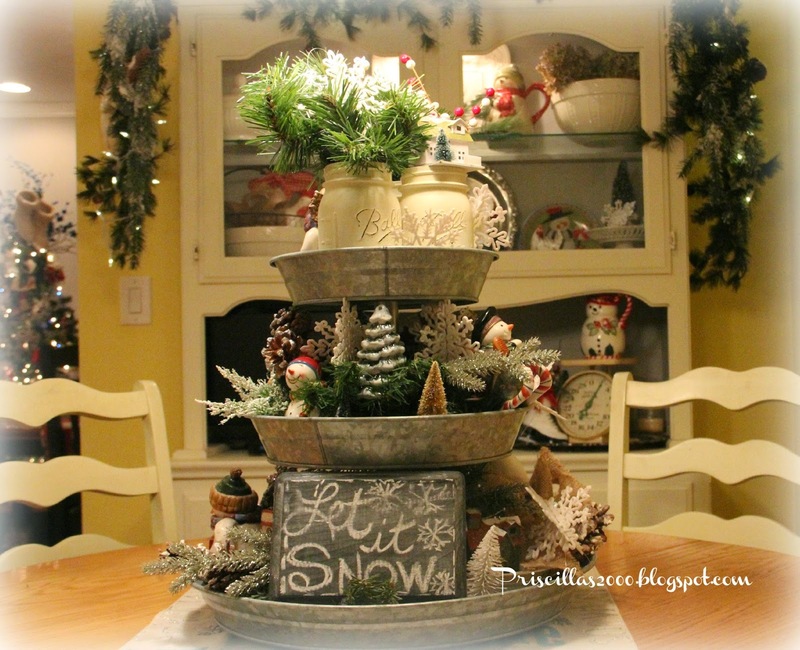 Your centerpiece is so neat and creative! 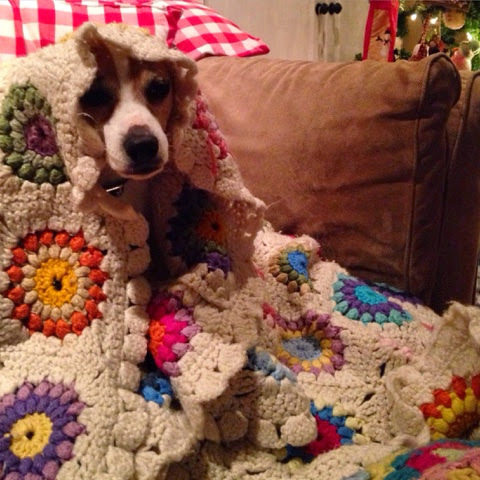 And your pooch is adorable all snug in that beautiful afghan! 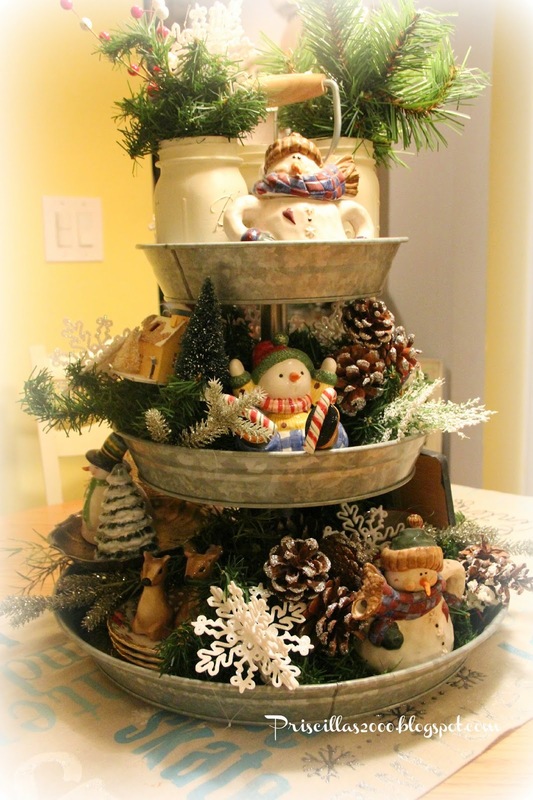 Priscilla, you always create a wonderful scene in that galvanized tiered tray! It really is a fun piece. Thanks for sharing with SYC. 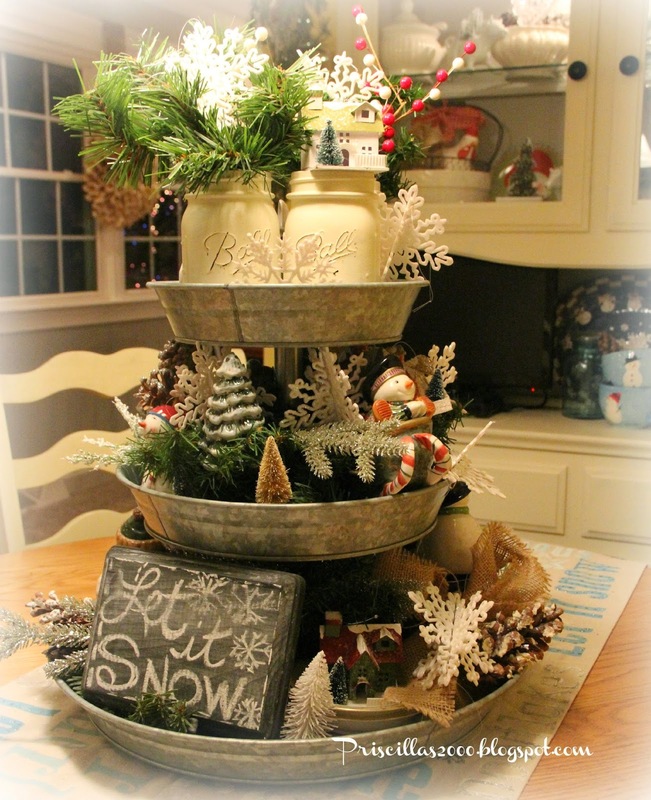 Love your décor in your tiered galvanized tray! 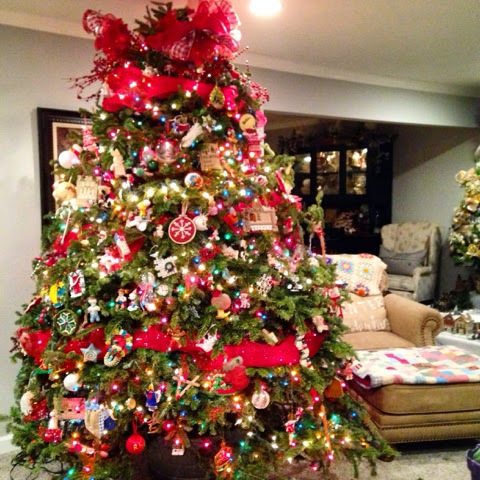 I liked hearing that you still have some "winter" trees up! I can't bear to be without lights around at this time of year and after having so many at Christmas. I always leave some up on the mantel and a few other places but maybe I'll take a hint from you and do a winter tree! Awesome tray I love how you styled it. Your centerpiece is so perfect for the winter. Love it.